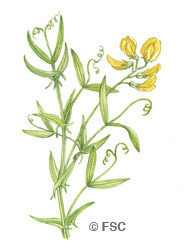 Meadow vetchling is a legume (see birdsfoot trefoil) that scrambles up through tall plants. It is a relative of the gardeners’ sweet pea. It is in flower from May to August, and the seeds ripen from July to September. It is foun on sites with more than 20 weeks of dry soil per year and 10-20 weeks wet soil per year. It is very tolerant of drought conditions, and less tolerant of waterlogging. It is typically found on moderately fertile sites (10-25 mg P/kg) or P index 1-2. Historically grown as an animal fodder due to its high protein content.